I can’t believe it’s over! 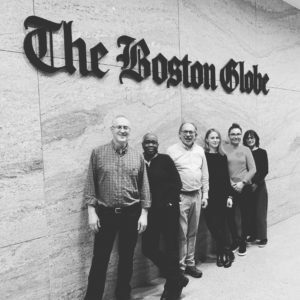 After five months of going to editorial meetings, discussing the most diverse topics — from local issues affecting the Boston area or New England to hot-button national issues like the Kavanaugh nomination (and subsequent confirmation) and the Khashoggi murder — I had to say goodbye to the Boston Globe! Having in mind that I had never been part of the editorial board of a newspaper, this experience was something that truly gave me an insight into the “other” side of a newspaper. I’ve spent the entirety of my career either as a beat reporter or a freelancer. The Boston Globe is a wonderful paper, and I’m already jealous of the next fellow who’ll get to join them in the fall!